Easy and Effective Strategies to Jumpstart a Sustainable, Waste-Free Lifestyle. We have a worldwide trash epidemic. The average American disposes of 4.4 pounds of garbage per day, and our landfills hold 254 million tons of waste. What if there were a simple–and fun–way for you to make a difference? What if you could take charge of your own waste, reduce your carbon footprint, and make an individual impact on an already fragile environment? Follow the five Rs: Refuse, reduce, reuse, recycle, and rot Build your own zero waste kit Prepare real food–the lazy way Make your own DIY household cleaners and toiletries Be zero waste even in the bathroom! Be part of the solution! Implement these small changes at your own pace, and restructure your life to one of sustainable living for your community, your health, and the earth that sustains you. 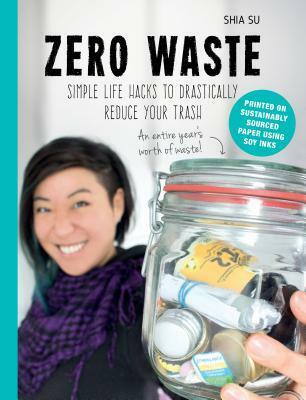 I’ve been wanting to get more into a zero waste lifestyle for awhile now, and this book has given me the push to actually go through with it! I was just browsing Barnes and Noble with my mom and she came across this book and pointed it out to me. She and I have been going on a small sustainability journey together, so the title stood out to her. I immediately had to have it, and here we are. I love the concepts that were talked about in this book because it really does make so much sense to be more environmentally conscious. Reducing your waste really isn’t that difficult to do, you just have to be diligent about it. There were some amazing tips and recipes throughout this book and I plan on doing a reread of it when I get back home for Christmas break. I think it’s a super amazing book to be able to flip through and reread. I highly recommend this book to you if you’re at all interested in a more eco-friendly and earth happy lifestyle. Zero waste (or low waste) is totally do-able. It also goes really hand-in-hand with minimalism, which I’ve also started to get into. Check out my lifestyle YouTube channel!